With over 20 years experience, DJ Mello is known as a party favorite in the Baltimore/DC area. Don't let the name fool you. DJ Mello will keep the party going all night long. Leaving your guests talking about your wedding reception long after its over! DJ Mello - making DJ's great again! Mix Masters Entertainment has been a family owned and operated business in Baltimore, Maryland since 1990. We are one of the area's most established and reputable DJ companies known for providing an unparalleled entertainment service for mobile events. We are known and recommended by some of the areas finest venues. We have always taken pride in our commitment to the quality for each couple we work with. Our record of tenure and performance in the entertainment industry proves that we stand behind the service we provide. We are passionately committed to professionalism, and we are able to design and customize individual projects that meet and exceed what our clients demand. Our attention to detail is second to none and our work proves it. YOU AND YOUR GUESTS WILL NEVER FORGET THE ENTERTAINMENT! and how it contributed in making your day into a memorable event. Let Mix Masters Entertainment help to create the memory that you want to have and not the one you wish you could forget. With Mix Masters Entertainment you can have confidence that every detail of your affair will turn out perfectly! The disc jockeys of Mix Masters Entertainment are experienced wedding professionals with YOUR needs and concerns in mind. We do more than just "play the music" at your reception - we have a genuine desire to make your wedding day a wonderful experience. Formal attire, enthusiastic attitude, extensive music knowledge and comprehensive skill in event coordination make us the best the industry has to offer! 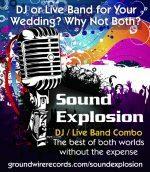 We are qualified emcees who help to coordinate your reception, and get involved to assure a carefree evening of fun and dancing for you and your guests.